Common in Guanacaste. Mostly Jan-May. Cultivated. Most travelers to Central America, who chance to try this native fruit, wonder why anyone would grow it, let alone buy and eat it! Some have compared the flavor to rancid sawdust. Even many native Costa Ricans keep it low on their list of edibles. However, it makes a rather nice juice, as an ice cream flavoring it is remindful of black walnut, and vino de Nance is fun. The species, a small tree, grows wild in the driest parts of the country but can be found cultivated as an ornamental throughout. 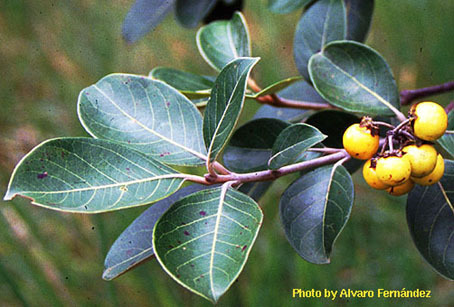 The bright orange and yellow flowers appear in the dry season and the controversial fruits appear in markets by July and August. A few other species in this medium-sized, primarily neo-tropical family of mostly woody vines are used for ornament, food or drugs.